Sfilata fil-Kapitali to take over the streets of Valletta this Saturday! Orfeo & Majnun: Sfilata fil-Kapitali, happening on Saturday 27th October in the streets of Valletta! About 3,000 animal puppets, 18 local band clubs, 360 dancers, hundreds of people from various Maltese and Gozitan communities, children, elderly, persons with special needs and many others, will animate the streets of Valletta during the European Capital of Culture’s Sfilata fil-Kapitali (Parade in the Capital), on Saturday 27th October from 2pm onwards … and you’re invited to join them! The show will run until late, when it reaches its peak with a great party at Triton Square from 9.30pm onwards. Those present are in for several pleasant surprises, in the form of music, dance, short performances and storytelling, with the participation of renowned personalities including those from Min Imissu and Klassi Għalina as well as Kinetic Dance Academy. Several animal puppets of all sizes were created for this occasion, during workshops held over the past months within communities across Malta and Gozo. During this colourful activity, the participants who built these mythic animals will animate and propel them around the streets of Valletta, accompanied by several band clubs, musicians, dancers, and many others. Everyone is invited to join them. 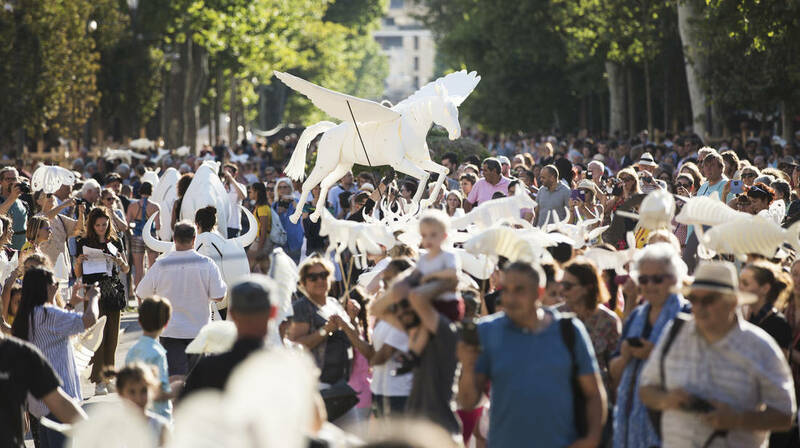 If you haven’t got your animal puppet yet, come to St George’s Square at 2pm to build your own animal puppet, and then, join in the fun in the streets of Valletta! Those who attend Sfilata fil-Kapitali may also benefit from special rates when using sustainable means of transport provided by Nextbike and Tallinja Bikes. Use the code 863386 when renting a Nextbike, for a journey of 60 minutes to or from the city free of charge. The code can be used twice, on two separate trips. Tallinja Bikes will also be available for travel within the city, at a discount of 50% during Sfilata fil-Kapitali. Terms and conditions apply. Download the Orfeo & Majnun information booklet here. For more information follow Valletta 2018 on Facebook. ‘Sfilata fil-Kapitali’ (Parade in the Capital) is the platform for citizen-created presentations related to the Orfeo & Majnun project. Orfeo & Majnun: A Tale of Love, Loss & Longing consists of a theatre of emotions, where ancient myths from different cultures meet. Orfeo & Majnun brings two love stories together – that of Orpheus and Eurydice, the ultimate Greek tragic love story, and Layla and Majnun, the classic Persian tale, that has come to be known as the Romeo and Juliet of the East.